Marinomonas mediterranea MMB-1T Solano & Sanchez-Amat 1999 belongs to the family Oceanospirillaceae within the phylum Proteobacteria. This species is of interest because it is the only species described in the genus Marinomonas to date that can synthesize melanin pigments, which is mediated by the activity of a tyrosinase. M. mediterranea expresses other oxidases of biotechnological interest, such as a multicopper oxidase with laccase activity and a novel L-lysine-epsilon-oxidase. The 4,684,316 bp long genome harbors 4,228 protein-coding genes and 98 RNA genes and is a part of the Genomic Encyclopedia of Bacteria and Archaea project. 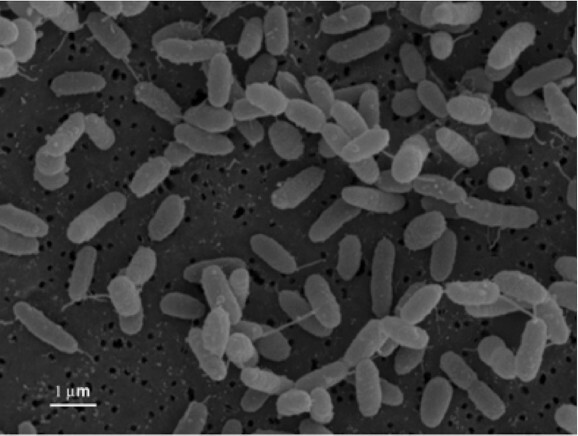 Strain MMB-1T (= ATCC 700492T = CECT 4803T) is the type strain of Marinomonas mediterranea, which belongs to the order Oceanospirillales within the class Gammaproteobacteria. The number of recognized species in the genus Marinomonas has increased in recent years and currently there are 20 species described [1–3]. M. mediterranea MMB-1T was isolated from a seawater sample [4,5]. Recently, it has been shown that this species forms part of the microbiota of the seagrass Posidonia oceanica . In spite of the increasing number of Marinomonas species described, M. mediterranea has two features that have not been seen in any other species of this genus; it synthesizes melanin pigments from L-tyrosine, in a process catalyzed by a tyrosinase, and it expresses a multicopper oxidase with laccase activity [6,7]. Here we present a summary classification and a set of features for M. mediterranea MMB-1T, together with the description of the complete genomic sequencing and annotation. M. mediterranea MMB-1T contains seven copies of the 16S rRNA gene. Of these, four were identical to each other, and hence they were considered as representative of this species. One of the copies differs from the others by the insertion of two nucleotides. Apart from that, the seven copies only show differences in two other positions. The representative 16S rRNA sequence only differs by a maximum of 4 nucleotides from the previously published 16S RNA sequence (AF063027), including two differences that correspond to ambiguous base calls. The phylogenetic neighborhood of M. mediterranea MMB-1T in a tree based on 16S rRNA sequences is shown in Figure 1. 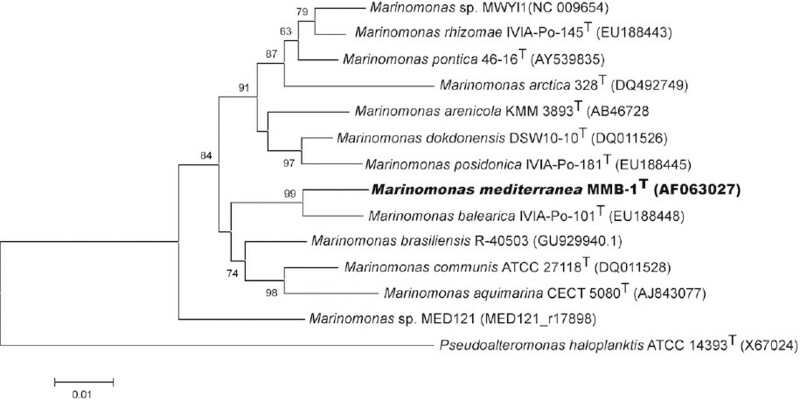 Phylogenetic tree highlighting the position of Marinomonas mediterranea strain MMB-1 in relation to other type (shown as T) and non-type strains within the genus Marinomonas. The non-type strains are those for which genomes have been sequenced. The tree was generated using the program MEGA version 4 . The sequences were aligned using the CLUSTAL W program within MEGA software. The tree was generated using the neighbor-joining method. Numbers at branches indicate bootstrap values from 1,000 replicates. P. haloplanktis (X67024) was used as an outgroup. The cells of M. mediterranea MMB-1T are generally rod-shaped with rounded ends with cell lengths and widths ranging from 1.3 to 2.0 and 0.6 to 0.7 µm respectively during exponential phase (Figure 2). Cells tend to be shorter during stationary phase. Strain MMB-1T is motile by a single polar flagellum  (Table 1). Electron microscopy revealed that strain MMB-1T synthesizes R-bodies, which are highly organized cytoplasmic structures that are considered to be related to the presence of defective prophages [20,21]. On complex media, such as marine 2216 agar, colonies are brown to black, due to the synthesis of melanin pigments (4). Na+ is required for growth of M. mediterranea MMB-1T, which can tolerate NaCl concentrations in the range of 1–5%. The strain grows over the range of 15–30 °C, is strictly aerobic and chemoorganotrophic and can hydrolyze gelatin and Tween80 but not starch. It utilizes D-glucose, D-mannose, D-fructose, sucrose, D-sorbitol, glycerol, L-glutamate, citrate, succinate, malate and acetate as carbon sources. Strain MMB-1T is sensitive to ampicillin (100 µg/ml), gentamicin (10 µg/ml), kanamycin (40 µg/ml), rifampicin (50 µg/ml) and tetracycline (10 µg/ml). Scanning electron micrograph of M. mediterranea MMB-1T. Classification and general features of Marinomonas mediterranea MMB-1T according to the MIGS recommendations. Free living and attached to Posidonia oceanica. Evidence codes - IDA: Inferred from Direct Assay; TAS: Traceable Author Statement (i.e., a direct report exists in the literature); NAS: Non-traceable Author Statement (i.e., not directly observed for the living, isolated sample, but based on a generally accepted property for the species, or anecdotal evidence). These evidence codes are from the Gene Ontology project . For the purposes of this specific publication, if the evidence code is IDA, the property was observed by one of the authors or an expert or reputable institution mentioned in the acknowledgements. This microorganism was selected for genome sequencing on the basis of its unique ability to express different oxidases of biotechnological interest, in particular, a multicopper oxidase with laccase activity . Laccases are enzymes of interest in processes such as lignocellulose degradation and removal of xenobiotics . The other oxidases are a tyrosinase involved in melanin synthesis  and a novel lysine-ε-oxidase with antimicrobial properties [23,24]. The genome comparison of this strain to Marinomonas sp MWYL1, which was shown to catabolize dimethylsulfoniopropionate (DMSP), releasing dimethyl sulfide (DMS) as one of the products , is also of interest. The genome was sequenced under the Community Sequencing Program, CSP-2010 of DOE Joint Genome Institute (JGI) who performed the sequencing, finishing and annotation. The genome has been deposited in GenBank under accession number NC_015276. Table 2 presents the project information and its association with MIGS version 2.0 compliance . In order to isolate quality genomic DNA for sequencing, Marinomonas mediterranea MMB-1T was grown from a −70 °C stock in MMC agar medium . A single colony was inoculated in the same broth medium and incubated overnight. This culture was used to reinoculate 200 ml of MMC in a 2 L erlenmeyer flask, at OD600 0.05. The culture was grown at 25 °C and 130 rpm to the beginning of the stationary phase of growth (OD600 0.8–0.9), then it was kept at 4 °C for 20 minutes to allow the ending of replication cycles. DNA isolation from this culture was performed using the CTAB method (Ausubel et al., 1994) with some modifications. The cells were harvested by centrifugation (6000 × g) and the pellet resuspended in T10E1 pH 8 to an OD600 of 1. The cell suspension was treated with 0.53% SDS (Sigma) and 0.1 mg/ml Proteinase K (Fermentas) at 37 °C for 30 minutes. After addition of RNase A (DNase-free from Qiagen) at 0.01 mg/ml, the cells were incubated at 37 °C for another 30 min. In order to remove cell wall debris, denatured proteins and polysaccharides, the NaCl concentration was raised to 0.6 M, and 28.5 mM of CTAB, preheated to 65 °C, was added to the cell extract followed by incubation for 10 min at 65 °C. CTAB-protein and CTAB-polysaccharide complexes were removed by chloroform/isoamyl alcohol (24:1), followed by phenol/chloroform/isoamyl alcohol (25:24:1) extractions. To precipitate the nucleic acids in the aqueous phase, 0.6 vol of isopropanol were added and the sample was incubated for 30 min at room temperature. The DNA precipitate was recovered by centrifugation, followed by a 70% ethanol wash that removes residual CTAB. The DNA pellet was resuspended in TE with 0.1 mg/ml RNaseA. The suspension was kept at −80 °C until further use. The draft genome sequence of Marinomonas mediterranea MMB-1 was generated at the DOE Joint Genome Institute using a combination of Illumina  and 454 technologies . For this genome, we constructed and sequenced an Illumina GAii shotgun library which generated 47,885,724 reads totaling 3,639 Mb, a 454 Titanium standard library which generated 577,566 reads and one paired-end 454 library with an average insert size of 10 kb, which generated 356,849 reads totaling 274.9 Mb of 454 data. All general aspects of library construction and sequencing that were performed at the JGI can be found at the JGI website . The initial draft assembly contained 58 contigs in one scaffold. The 454 Titanium standard data and the 454 paired end data were assembled together with Newbler, version 2.3. The Newbler consensus sequences were computationally shredded into 2 kb overlapping fake reads (shreds). Illumina sequencing data were assembled with VELVET, version 0.7.63 , and the consensus sequences were computationally shredded into 1.5 kb overlapping fake reads (shreds). We integrated the 454 Newbler consensus shreds, the Illumina VELVET consensus shreds and the read pairs in the 454 paired-end library using parallel phrap, version SPS - 4.24 (High Performance Software, LLC). The software Consed [32–34] was used in the following finishing process. Illumina data were used to correct potential base errors and increase consensus quality using the software Polisher developed at JGI (Alla Lapidus, unpublished). Possible mis-assemblies were corrected using gapResolution (Cliff Han, unpublished), Dupfinisher , or by sequencing cloned bridging PCR fragments with sub-cloning. Gaps between contigs were closed by editing in Consed, by PCR and by Bubble PCR (J-F Cheng, unpublished) primer walks. A total of 159 additional reactions were necessary to close gaps and to raise the quality of the finished sequence. The total size of the genome is 4,684,316 bp and the final assembly is based on 178 Mb of 454 draft data, which provide an average 37.9× coverage of the genome and 3,508 Mb of Illumina draft data which provide an average 746.4× coverage of the genome. Genes were identified using Prodigal  as part of the Oak Ridge National Laboratory genome annotation pipeline, followed by a round of manual curation using the JGI GenePRIMP pipeline . The predicted CDSs were translated and used to search the National Center for Biotechnology Information (NCBI) non-redundant database, UniProt, TIGRFam, Pfam, PRIAM, KEGG, COG, and InterPro databases. These data sources were combined to assert a product description for each predicted protein. Non-coding genes and miscellaneous features were predicted using tRNAscan-SE , RNAMMer , Rfam , TMHMM , and signalP . Further comparative analysis was performed using the IMG-ER system . The genome has no plasmids, and the 4,684,316 bp circular chromosome has a GC content of 44.13% (Table 3 and Figure 3). Of the 4,326 predicted genes, 4,228 were protein-coding genes, and 98 RNAs; 105 pseudogenes were also identified. The majority of the protein-coding genes (73%) were assigned with a putative function while those remaining were annotated as hypothetical proteins. The distribution of genes into COGs functional categories is presented in Table 4. Graphical circular map of the chromosome. From outside to the center: genes on forward strand (color by COG categories), genes on reverse strand (color by COG categories) RNA genes (tRNAs green, rRNAs red, other RNAs black), GC content, GC skew. b) Pseudogenes may also be counted as protein-coding or RNA genes, so are not additive under total gene count. The genome sequence of strain MMB-1T revealed some interesting features in relation to its known enzymatic activities of biotechnological interest. There was one copy of an operon responsible for melanin synthesis from L-tyrosine . The genes forming part of this operon are Marme_3962, encoding a tyrosinase (PpoB1), and Marme_3961, which encodes a membrane protein (PpoB2) involved in copper delivery to the tyrosinase . BLAST-based searches using the sequence of this M. mediterranea tyrosinase against the Proteobacteria deposited in IMG as of Sept 2011 retrieved only 18 hits at a cutoff value of <e−20. Among those hits, only one was from another Gammaproteobacteria, namely the product of the HCH_03392 gene from Hahella chejuensis KCTC2396, which was 45% identical at the polypeptide level to the M. mediterranea PpoB1 enzyme. Interestingly, genes whose products closely resemble those of Marme_3962 and Marme_3961 are also found adjacent to each other in Hahella chejuensis (genes HCH_03392 and HCH_03391) as well as in several distantly related bacteria, including Rhizobium vitis (Agrobacterium vitis) S4 (genes Avi_2427 and Avi_2428) and Citreicella sp. SE45 (genes CSE45_2624 and CSE45_2624), both of which are in the Alphaproteobacteria. This suggests that the operon encoding the tyrosinase and its chaperone have been transferred by horizontal genetic transfer mechanisms. Regarding L-tyrosine metabolism, the annotation of the genome of M. mediterranea revealed genes encoding proteins involved in tyrosine degradation. Two of those genes (Marme_3331 and Marme_4181) encode putative transaminases, which could generate p-hydroxyphenylpyruvate. Interestingly, the catabolic route from this compound is incomplete, which could explain why M. mediterranea can use L-tyrosine as nitrogen source, but not as a sole carbon source . In addition to the tyrosinase, another polyphenol oxidase of biotechnological interest, PpoA, is expressed by M. mediterranea. PpoA is a multicopper oxidase with laccase activity  and is encoded by the gene Marme_0056. A BLAST-based search using the sequence of this protein, with a cutoff value of e-20, revealed several homologues in different proteobacteria, including 17 hits (out of 678 genomes) within the Gammaproteobacteria. Interestingly, the three strains mentioned above (H. chejuensis KCTC2396, R. vitis S4 and Citreicella sp. SE45) in which the tyrosinase operon was conserved, also contain genes encoding proteins similar to PpoA. However, genome analysis does not offer indications of possible co-transfer of both genes since ppoA-like genes are not close to ppoB-like genes in any of the genomes analyzed. 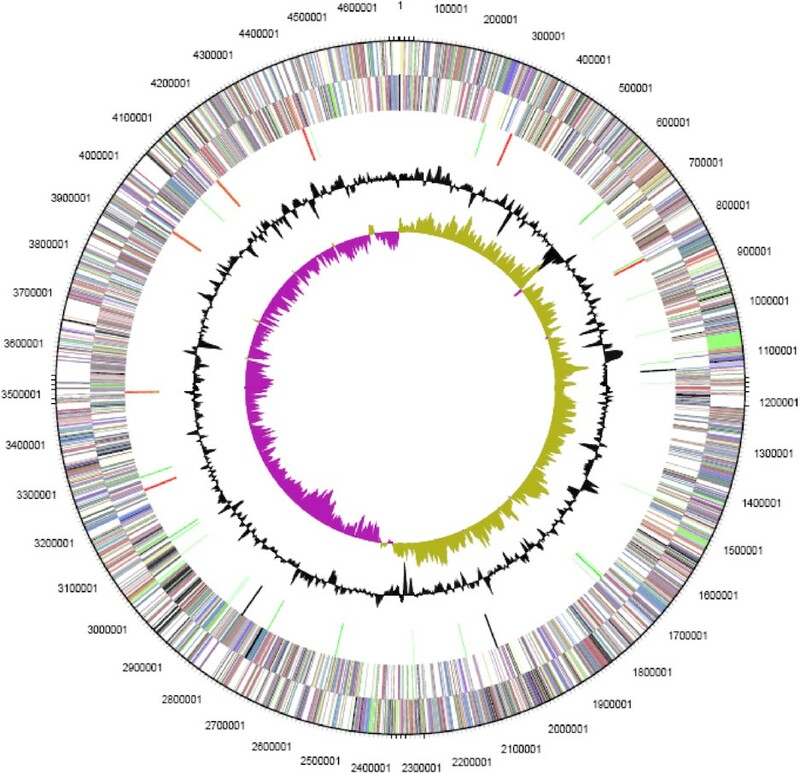 The genome of M. mediterranea also contains a locus, Marme_2975, encoding a protein with 31.9% identity to the protein RL5, described as possessing laccase activity, which was detected from a metagenomic library . In the case of M. mediterranea, a mutation in the gene Marme_0056 abolishes laccase activity in all the conditions studied , so the possible laccase activity of the product of Marme_2975 remains to be determined. In this regard, we note that homologues of Marme_2975 also occur in the other Marinomonas strains that have been sequenced: M. posidonica IVIA-Po-181T (Mar181_0693), Marinomonas sp. MED 121 (MED121_05683) and Marinomonas sp. MWYL1 (Mmwyl1_3610), which do not show laccase activity (Sanchez-Amat, unpublished observations). An enzyme (LodA) with L-lysine-epsilon-oxidase activity (E.C:1.4.3.20) was described for the first time in M. mediterranea (14). The gene (Marme_2662) encoding this enzyme forms part of an operon with lodB (Marme_2661), which encodes a protein of unknown function but is required for expression of LodA . LodA is an unusual L-amino acid oxidase (LAO), since it is a quinoprotein and does not contain FAD as cofactor, unlike most other LAOs. When the sequence of LodA was used as a query against the genomes of Proteobacteria in IMG, 22 hits to gene products in different classes of bacteria were detected with a cutoff value of <e-20. Interestingly, it was clear that M. mediterranea itself had two additional genes (respectively Marme_2396 and Marme_1655) that encoded polypeptides that resembled LodA, being respectively 23.3% and 24.4% identical to it. The products of three genes in the NCBI database of bacterial genomes (Mmwyl1_3721 of Marinomonas sp. MWYL1, PTD2_20217 (alpP) of Pseudoalteromonas tunicata D2 and Nhal_1019 of “Nitrosococcus halophilus” Nc4) were extremely similar in sequence (E value of 0) to LodA of M. mediterranea, strongly indicating that these, too, encode enzymes with L-lysine oxidase activity. In fact, this has been experimentally demonstrated for one of these, namely AlpP of P. tunicata . A preliminary screening of all those genes similar to lodA in M. mediterranea and other bacteria revealed that they also form part of an operon containing a gene similar to lodB. In relation to L-lysine metabolism, it is also of interest that up to 14 genes encode proteins annotated as lysine exporter proteins (LYSE/YGGA). This property could be related to the extracellular activity of the L-lysine oxidase that oxidizes L-lysine, generating hydrogen peroxide, which participates in cell death during biofilm development . Genome analysis of strain MMB-1 indicates that it contains all the enzymes required for L-lysine biosynthesis. Although M. mediterranea cannot use L-lysine as sole carbon and energy source, it can use this amino acid as nitrogen source even in mutants lacking LodA activity [45,48]. Therefore, there must be some other enzymatic activities involved in nitrogen assimilation from L-lysine, but genome analysis has not revealed their identity. Another strain of this genus, namely Marinomonas sp. MWYL1, was shown to grow at the expense of DMSP, an abundant intracellular compatible solute that is made by many marine phytoplankton. One of the products was DMS, an environmentally important gas that can affect climate. The enzyme that generated the DMS from DMSP was encoded by the gene dddD (Mmwyl1_4041) , and a very close homologue (the protein products are 80% identical) was found in the genome of M. mediterranea MMB-1 (Marme_2354). In addition, the organization of other genes involved in the import of DMSP and some of the downstream catabolic steps were also conserved in their locations and their sequences in the two Marinomonas strains. The work conducted by the U.S. Department of Energy Joint Genome Institute is supported by the Office of Science of the U.S. Department of Energy under Contract No. DE-AC02-05CH11231. Work on Marinomonas mediterranea was supported by several grants from the Spanish Ministerio de Ciencia e Innovación (Current project BIO2010-15226) and the Fundación Séneca (CARM, Spain) (Current project 11867/PI/09).